One of Anderson Equipment Company's biggest assets continues to be our employees. When you come to Anderson, you can be assured that knowledgeable and dedicated people will be assisting you. Over 50% of Anderson Equipment personnel have been with our company for at least ten years. More than 70% of Anderson Equipment service technicians have more than 15 years of industry experience. We uphold the highest standards of reliability, honesty and dedication. Anderson Equipment Company is committed to offering our customers top-to-the-line equipment. We continue to refine our product portfolio to ensure that customers can choose from a wide selection of quality equipment to meet their specialized needs. Anderson understands the importance of product availability as it relates to customer productivity. 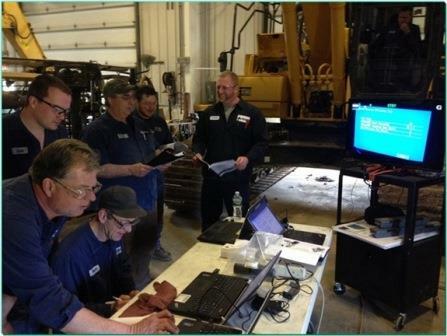 With 18 full service locations across six states and one of the largest rental fleets in the northeast, Anderson Equipment customers continue to view us as their distributor of choice. If your needs call for purchasing new or used equipment, rent to rent or rent to buy, we have the equipment available when and where you need it! One of Anderson Equipment Company's core-competencies continues to be unparalleled service. Anderson's award-winning technicians are among the most helpful, knowledgeable and efficient in the country. Our technicians are provided with over 36 hours of training per year to help them stay current with today's technology. In addition, we have over 70 state-of-the-art field service trucks designed to facilitate on-site diagnostics and service repairs from virtually any location. Customers have come to rely on Anderson for our responsiveness and diligence when addressing their service needs.